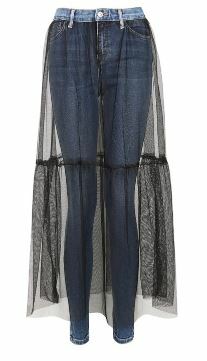 Oh Topshop, what were you thinking? Have you ever put on a pair of jeans and wished there was a window to your knees? No? Then you’re not the target market for Topshop’s latest denim design. 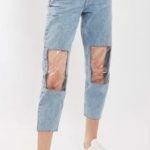 I can’t think who they think the target market is, but somebody somewhere thought there was a gap in the market for a pair of jeans with see through plastic knee patches. So many questions. The main one being “why?” Followed by “why, why, WHY?” Followed by “wouldn’t they make your knees sweat?”, “wouldn’t they steam up?” and “WHY?” quite a few more times. I could write at length about how fecking ridiculous these things are, but what would be the point? I think everyone reading this knows how ridiculous they are, without me helping you along in the thought process! 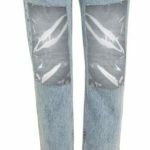 Not quite as bad, but still downright ridiculous are these party skirt jeans, which are also available on their website. Topshop – Twit of the Day! 6 Comments on Oh Topshop, what were you thinking? This has made me giggle so much! I’m not a fan of ripped jeans anyway (not since ny Brosette days) but who the hell needs a window in their jeans??? There are obviously people out there who have such beautiful knees that they want to be able to expose them in all weathers! That first sentence! Laughing so much! Haha. Never thought of giving my knees the spotlight before…maybe is time! Never mind the thigh gap, your knees are the hottest accessory on your bod! Haha I love it! So tempted to get those jeans, just for fashion laughs!